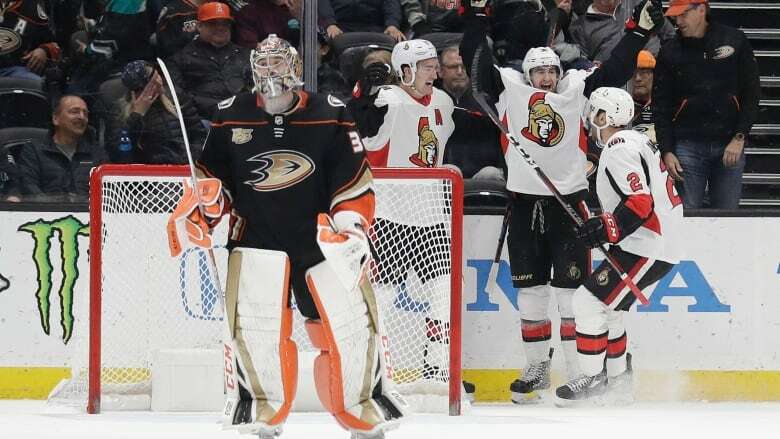 Colin White scored at 1:34 of overtime and the Ottawa Senators snapped an eight-game losing streak by rallying for a 2-1 victory over the reeling Anaheim Ducks on Wednesday night. In a matchup of teams with eight-game losing streaks, Colin White was able to provide some much-needed relief for the Ottawa Senators. White's 11th goal at 1:34 of overtime lifted Ottawa to a 2-1 victory over the reeling Anaheim Ducks on Wednesday night. While the Senators got off to a good start on their three-game road trip, the Ducks have lost a franchise-record nine straight — surpassing an eight-game skid in October 1996. "It felt great to get that push at the end and finally come up with a win," said White, who scored his second game-winning goal of the season. Mark Stone brought the puck into the zone and found White near the net, and he slid the puck past Anaheim goaltender John Gibson. "I saw [Stone] skating. I was in front of him so I slowed down a little bit for him and he made a great play so I could tap it in," White said. Ottawa coach Guy Boucher said the plan was to play with patience and keep it a low-scoring game. The Senators trailed 1-0 after two periods, but Bobby Ryan tied it midway through the third. "We feel like we were in a lot of games lately and we let them go away in the third period and get away from us. Tonight we just stuck with it," Ryan said. Anders Nilsson stopped 32 shots for his fourth win in 15 games. Five of the Senators' last six games have been decided by one goal, but this was the first time they came out with a win. "We got the bounce and in the other games we didn't get the bounce," Boucher said. Jakob Silfverberg had Anaheim's lone goal, and Gibson made 28 saves. The Ducks have played an NHL-leading 13 overtime games at home and are 5-6-2. They are also 0-2-3 during a six-game homestand, their longest of the season. "Right now we're playing at the end of our sticks and our shots might not be as well-placed as before," Silfverberg said. "It's definitely something we're working on." The Ducks have scored two or more goals only three times and are 3 of 31 on the power play during their losing streak despite having the edge in shots in five games. "We seem to be snake-bit around the net. We've had amble chances, but haven't been able to find the back of the net consistently," coach Randy Carlyle said. Silfverberg opened the scoring at 8:52 of the first when he took a pass from Brandon Montour and put a one-timer past Nilsson from just outside the right faceoff circle for his 11th of the season but only second in the past 11 games. Ryan tied it at 9:23 of the third period when he got the rebound of Gibson's save on Dylan DeMelo's shot and was able to chip it under Gibson's left pad for his eighth of the season. It was his third goal and eighth point in 11 games against his former team, which drafted him second overall in 2005. The Senators' right wing also extended his point streak to five games (two goals, four assists).